VIVO STAND-V002 allows for ergonomic viewing which encourages healthy body positioning and helps reduce fatigue and strain on the neck, shoulders, and eyes. In our list of Top 5 Best Monitor Stands, it ranked at #1. 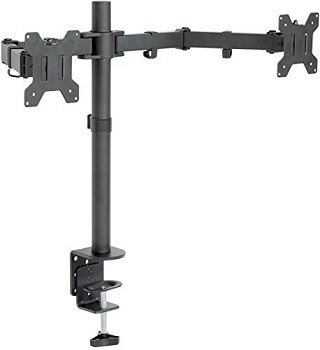 VIVO STAND-V002 is identical to its predecessor except it has two mounting arms. The base of the stand is made with soft touch materials so that the desk doesn`t get scratched. It`s made of high-grade steel and aluminum with black finish. 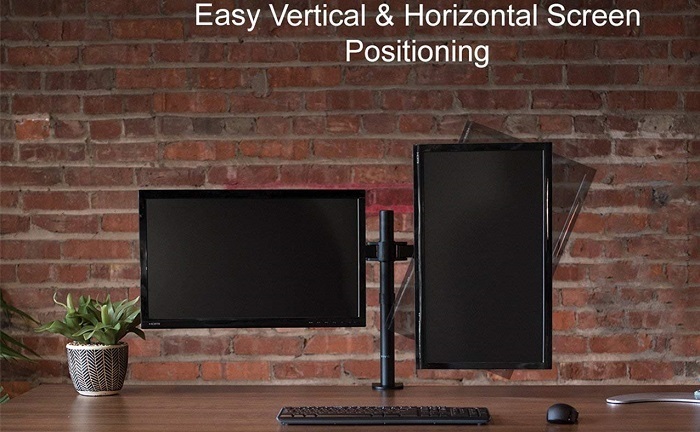 The maximum distance between two brackets is 29 inches, so you will be able to fit two monitors between 13-27 inches and position them however you’d like. VIVO STAND-V002 has six top joints with 180-degree articulation and can be tightened to make the arms as fluid or stationary as desired. The versatility of screen placement allows for ergonomic viewing which encourages healthy body positioning and helps reduce fatigue and strain on the neck, shoulders, and eyes. The clamp style mount clears up valuable desk space removing unwanted clutter. • Comes with a C-clamp and a grommet base for attached to different tables. • The horizontal adjustment needs some improving. • Grommet base may leave marks on the surface it`s been attached to. VIVO STAND-V002 provide a versatile screen placement allowing ergonomic view and reducing strain and fatigue on your shoulders, eyes, and neck, along with a Clamp mount that frees up unwanted clutter.